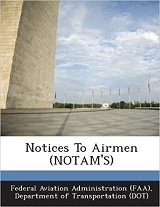 Everything you will ever need to know about Notices to Airmen (NOTAM) is contained in this book, Notam's Illustrated, written by air traffic control specialist Jerome Miller who, as part of his job, issues notams. Organized much like a glossary, it borrows heavily from the official FAA publication on notams. Don't expect it to read like a novel. There are definitions of 400 notam contractions and an explanation of distant, local, and FDC notams. There is also a four-page section on temporary flight restrictions. One thing not discovered during a quick scan of the book was a definition of the term notam. Ignoring the fact that the actual title of the book misuses an apostrophe -- it should correctly be Notams Illustrated -- there is a lot of good information of value to flight instructors who must teach the subject. It's a step up from digesting the official FAA publication on the subject, FAA Order 7930.2. The soft-cover spiral-bound book has 110 black-and-white pages and numerous examples. Although the title implies there are illustrations, there are no pictures or drawings. Have instant access to 400 decoded NOTAM contractions, with page references taking you to more detailed information. Interact with hundreds of NOTAM examples about airport movement areas, runways, navigational aids, TFRs and much more. No NOTAM puzzle will ever go unsolved when using this total and complete resource. Jerry Miller is a former U.S. Air Force air rescue helicopter pilot and FAA ATC flight service specialist with over 20 years experience providingaviation weather and NOTAM data to pilots of all experience levels.